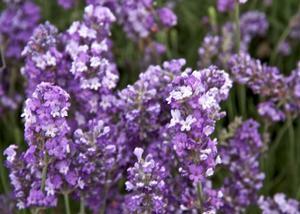 Maillette English lavender is prized for the high quality of its oil content. 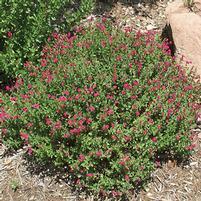 Plants form a loose mound of aromatic grey-green foliage around 2' tall and wide. The slender flower stems bearing barrel-shaped violet flowers rise up to 18" above the foliage. Lavandula angustifolia 'Maillette' is a selection of lavender grown both in France and England for the high yield and quality of its sweet-smelling oil. The flowerheads of 'Maillette' are packed full of tiny plum to lilac star-shaped flowers, and are barrel-shaped rather than spiked. Grow where full sun brings out the heady fragrance, and enjoy the buzz of the bees. The variety was introduced by Pierre Grosso, of Grosso Lavender fame, and raised in France for oil production. Maillette was introduced in the U.S. around 1981. 'Maillette' is a bush with a loose habit, although when mature its green foliage is erect with upswept branches. It grows to 3 feet in bloom. It blooms later than most English cultivars, blooming from June-August. Flower stems can be up to 18 inches long, and the slender, loose flower spikes 3 inches or more. The flowers are striking, with dark violet-blue corollas and soft dark purple calyces. It is an elegant cut flower, and dries well. 'Maillette' is the main field variety of L. angustifolia grown in France today. It produces an abundance of high quality oil. Aroma is considered to be strongly fragrant. It is a more disease resistant selection than many of the English lavenders, so is more forgiving of heavy clay soils. Lavandula angustifolia has narrow leaves and short stems with flower heads that are barrel-shaped as opposed to spikey as in the lavandula x intermedia variety. Monsieur Maillet was a respected small farmer from the Valensole, who had 'judged oils derived from plants which he had selected continuously for the last thirty years' (Paulet, 1959). It is highly probably that 'Maillette' was one of his own selections and not from Pierre Grosso as stated by Tucker (1985). It appeared to be quite widely planted in the 1950s." Hardly any maintenance is needed; usually just an annual shearing. After blooming's finished for the year, follow the rounded outline of the plant and shear off all the flower stems together with around 2" of the leafy stems. This will encourage new shoots to sprout and keep plants looking bushy.